Discover how to integrate the WhatsApp Business API into your customer engagement strategies and explore three use cases for business messaging. So you’ve decided to build a WhatsApp Business profile—and why wouldn’t you? With over 1.5 billion people using the messaging app, it just makes smart business sense to engage with your customers on the app they’re already familiar with. With WhatsApp Business, you can create a business profile, complete with details like your company’s website address, physical location, and contact information, and then easily connect with your customers in the same way they connect with friends and family every day. It’s an ideal environment to message customers, send them alerts, notifications, and updates, and answer any questions they may have. WhatsApp currently ranks as the most popular messaging app in the world, leading the pack with over 60 billion messages delivered daily. That doesn’t mean, of course, that all of your customers use the application, but it’s likely that many of them do. A quick look at the adoption of messaging services reveals that the go-to-app for American and Canadian consumers is Facebook Messenger, with WhatsApp coming in a close second. 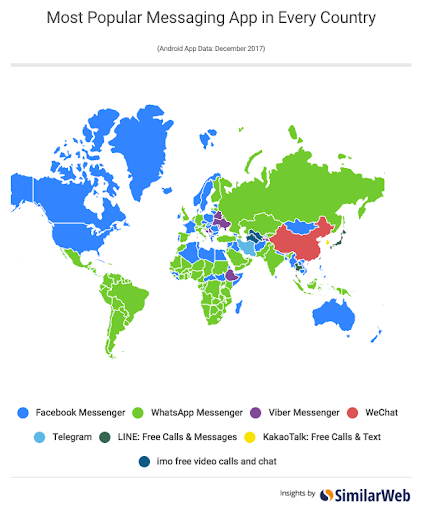 The popularity of WhatsApp in Latin America, Europe, Africa, and in some parts of Asia, however, is unrivaled. Alternatively, if the majority of your customers reside in China, they’re likely more familiar with WeChat, a messaging app that’s more popular in that part of the world. Interested in a large-scale international reach? You’ll want to access the WhatsApp Business API without hesitation. But if you’re on the fence about whether or not to add yet another communication channel to the mix, consider that nearly three out of five consumers are frustrated by being unable to access the business information they want in their communication method of choice. In other words, if you’re not offering a way for your customers to reach out using the apps they use every day, you’re making it harder than it needs to be to keep them happy. And if your customer is searching for your business on WhatsApp and you’re not there, you can bet your competitor would be happy to take that call. If you move forward and decide to set up a WhatsApp business profile, be sure to keep your customers—and your employees charged with servicing them–top of mind as you design how messaging fits into your customer engagement strategies. You don’t want to build a messaging app and not have the tools, processes, and agents in place to make it the best possible experience should your customers choose to connect with you there. WhatsApp Business gives you the opportunity to interact with your customers in a private, secure environment, allowing you to interact with them in a more informal and friendlier way. In theory, that makes it a messaging marketer’s dream, but WhatsApp is proceeding cautiously on what they will let businesses do within their environment. The company’s goal is to create a compelling and powerful customer experience similar to the appeal of how WhatsApp is currently used, and that’s why—as of this writing—mass targeting of advertising and promotions are not allowed. That said, marketers can still leverage WhatsApp to build relationships and inject their brand throughout the entire communication experience, with the caveat that organizations stay within the realm of acceptable WhatsApp policies. That means that businesses can only send messages (e.g., notifications, account verifications, and customer service responses) to WhatsApp users that have explicitly opted-in to receiving them. Unwelcomed solicitations are a no-go and can hurt your chances of being allowed to continue to use the application to reach global customers, 24/7. Order status: Inform customers of the state of an order or transaction, which could consist of confirmations, pricing adjustments, scheduling, or delays in fulfillment. Shipment Information: Estimated time of arrival (ETA alerts) are sent early on in the messaging cycle and provide an easy way to issue periodic notifications on the status of when a delivery -- or a delivery person -- will likely reach its destination. Once the shipment is complete, a notification can be sent to alert the recipient or customer. Travel notifications: From booking travel—including delivery of boarding passes, travel guides, and customs information—to providing real-time flight information, keep customers updated about relevant changes to itineraries right within the WhatsApp ecosystem. Staff communications: Employees need to be kept abreast of everything from shift scheduling to dispatch notifications. Instant messaging via WhatsApp enhances communication, gets noticed more quickly than email, and enables real-time responses from employees. Privacy and security are ingrained into WhatsApp's DNA, which is why the app is so trusted by users worldwide. You can’t become a WhatsApp user without being verified by WhatsApp. Once authenticated, WhatsApp provides a secure and private channel for message delivery with complete end-to-end encryption. Only the parties involved in a WhatsApp chat will ever see their chat messages—that includes privacy from WhatsApp or any other third party. Since the app uses phone number-based addressing, the user's phone number is—by default—a verifiable source for your extra security measures. Any chats you have with customers, including written messages, photos, videos, voice messages, documents, status updates, and calls are protected from falling into the wrong hands via WhatsApp’s end-to-end encryption. From a business perspective, that means that you can rely on WhatsApp’s built-in user verification process to be certain that a user is who they say they are. Similarly, that verification process helps your customers know you’re an officially approved business within the WhatsApp ecosystem. User verification: When a new user applies for your service or signs up on your mobile app, you’ll want to make sure they’re real and not a bot. This is typically done by sending a new user a one-time numerical code via SMS (which has recently been deemed as less than 100% secure.) Instead, why not send verification codes via WhatsApp—itself already super secure—and require the user to re-enter that code in your app to gain verified access. WhatsApp is an excellent channel to offer new users a safe place to prove they are legitimate account holders, and that they are who they claim to be. Two-factor authentication (2FA): In addition to account verification, there may be occasions when, as a business, it's prudent to verify actions a user may take even after you’ve confirmed them at sign-up. This could be something like authenticating a purchase, or other financial transaction made directly on your app. Or maybe you periodically require customers to update personal information on their account. As a second factor of authentication, send a one-time code to that user via WhatsApp as an SMS alternative. Make it necessary for the user to re-enter that code before the transaction or account change is completed. Again, the embedded encryption of the WhatsApp message delivery combined with two-factor authentication security makes WhatsApp a trusted channel for users looking to prove they are who they say they are and that they are indeed making an intentional transaction. Two-way conversations: When compared to other channels (email, for example) back-and-forth messaging makes it simpler for agents to answer questions, clarify issues, quickly resolve problems, and to guarantee your customers’ loyalty. Just make sure your team is staffed accordingly. If resources are limited, let customers know when it’s best to reach a live agent, or what to expect in terms of wait time. Also, be sure you have tools in place to escalate to a real person, if necessary. Notification support: You may opt to send automated notifications to your customers, but they may want to respond back in real-time. Anticipate this preference by allowing them to reply to any message sent. Based on their responses, you can best determine if an auto-reply will suffice, or if a live conversation is best. Either method is a great way to kick off a positive customer experience. Quick replies: Turn FAQs into abbreviated canned responses to handle the most routine questions. Be sure to route these messages accordingly, think through all possible answers to anticipated questions, and provide them in simple language that’s suited for the messaging medium. Automated responses: Opening your customer response solution to a global audience using WhatsApp means that customers may reach out from every time zone and throughout the day—even when you’re closed. Consider automating and customizing 'away' messages when your employees are handling other calls and unavailable to reply; or during off-hours when the department is unattended. Intelligent bots: Consider making use of artificial intelligence and data analytics to enable a “virtual agent” to reply based on the context of a customer’s incoming message. Bots allow your business to respond to customer messages promptly and to increase the number of customers you can communicate with at once. It’s a scalable way to tackle the previously unscalable problem of customer support. Think Out-of-the-Box and Make WhatsApp Business Fun. Engage in real conversations: Unlike SMS, there are no short codes needed. Messages can be as lengthy as is necessary to get your point across, but remember that the recipient is likely getting it delivered to their phone, and is probably used to message brevity, so engage efficiently. Express yourself: WhatsApp supports richer formatting. Don't shy away from using bold text, or colors, or italics. Or text that is bold, colored, and italicized, all together. Plus, WhatsApp Business supports Markdown, a simple plain text formatting system that'll help make every message stand out. Get creative: Have a bit of fun and make use of emojis, foreign language characters, images, audio, and video. You can also share product demonstrations, and engage in 2-way customer surveys. Manage expectations: Let customers know exactly what to expect from your WhatsApp support channel. Provide clear guidelines for when your WhatsApp team is available. And be sure to offer alternative options for support—be it SMS, phone, or email—if you won’t be manning WhatsApp round-the-clock. Enable conversational commerce: Consider how you might be able to use WhatsApp to support sales efforts by answering questions about products and services with rich, contextual messages that may, ultimately, facilitate a new transaction or keep a current customer happy. With a customer base in the millions spanning 200 countries—and a sophisticated, omni-channel communication program already in practice—SnapTravel understood the benefits of WhatsApp Business immediately. SnapTravel knows that to deliver exceptional customer experiences, you have to connect with customers on the channels they prefer. The company accomplishes this by allowing users to find and book hotel rooms on a variety of messaging channels, such as SMS, Facebook Messenger, and Alexa. And, as of 2018, SnapTravel is now available to 1.5B users on WhatsApp. To support ease of booking, they also make use of advanced natural language processing to allow customers—regardless of channel—to interact with an intelligent bot the same way they would chat with a friend. If you're ready to start building a business presence on WhatsApp, consider Twilio. Integrating Twilio’s WhatsApp Business API is the simplest and best way to quickly get your WhatsApp messaging app up and running. Since WhatsApp is currently gating the number of new applications going to production, you can pre-build and test your WhatsApp business presence in a secure development sandbox while your request for WhatsApp access is reviewed.. Plus, with Twilio as your partner, you get the added benefit of using the very same API to add virtually any communication channel you want (think SMS, Facebook Messenger, WeChat, and LINE) to be sure you’re engaging your customers, however, whenever, and with whatever app they’re using. Ready to connect with your customers in a whole new way? Request access for your Whatsapp Business Profile today, and we’ll walk you through the process.